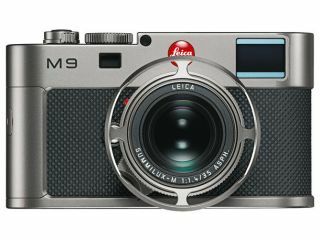 Leica has unveiled a limited edition version of its M9 camera, which costs in the region of £20,000. Limited to just 500, the Leica M9 Titanium has been designed by Walter de'Silva whose day job it is to design cars. Leica is calling the M9 Titanium "a unique camera with a new interpretation of the characteristic features of Leica rangefinder cameras, which lends precision engineering, unique style and solid titanium to extraordinary formal design." We call it the perfect tool to give your bank manager a heart attack. Do you Leica the price? When the M9 was first announced back in September of last year it was being touted as the 'world's smallest full-frame sensor' camera in the world. And its price wasn't exactly cheap then, with the M9 retailing for a whopping £4,850. By recreating the whole thing in titanium and bathing the chassis in a saffron and truffle mix*, de'Silva and his team has a rather desirable and hugely expensive product. The Leica M9 Titanium has a UK release date of November 2010 and will be available from authorised Leica dealers. It will cost £19,800 (VAT inclusive). For more information, head over to PhotoRadar.com. *this isn't strictly true, but it does have a trim made from leather usually found in high-end Audis.